Since 1927, Hoarel Sign has helped all categories of businesses get their name before the public in a big, bright way. 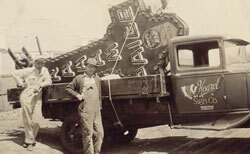 For over 80 years in the same location, Hoarel Sign is a family owned business now into our 3rd generation. Current ownership Gary Cox �President, Ray Cox � Vice President, Lisa Cox Orosco-Secretary, and Linda Cox-Treasurer. Hoarel�s client base has ranged from the largest to the smallest customer. Our pledge to customers is not just to sell them a sign but we want to make them life-long customers. We want to provide quality repair, manufacturing and service on every sign product we sell. Hoarel Sign Co. is a member of the Texas Sign Association, World Sign Association, International Sign Association, United States Sign Council and New Mexico Sign Association. We were finalists in 2004 and 2005 Better Business Torch Awards for Marketplace Ethics. Our employees have more than 40 years of combined experience in the sign industry to offer our customers with talent, creativity and quality workmanship. We specialize in design, manufacturing, service and maintenance. Please call us today for any of your sign needs!